Dr. Catherine Hamlin and her team were recently in the states for the launch of Hamlin Fistula USA. 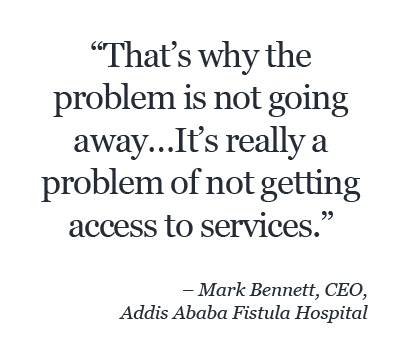 Following is an exclusive interview with Dr. Hamlin and Mark Bennett, CEO of Addis Ababa Fistula Hospital. By, Tiberah Tsehai: In Amharic Emiye is an endearing term for mother: what Dr. Catherine Hamlin represents to those she has touched in Ethiopia and around the four corners of the world. Like a mother she cares for the poorest daughters of Ethiopia. They are shunned and often think of suicide as an escape from their harrowing state. They suffer from obstetric fistula- one of the most devastating childbirth injuries- usually caused by several days of obstructed labor. Often, a stillborn is delivered and the woman is left with incontinence. Although obstetric fistula has been eradicated in the United States for more than 100 years it is still prevalent in developing countries. For over 50 years Catherine Hamlin has not only been repairing these women from their injuries but she has educated them, loved them, and sent them home in a new dress. An Australian gynecologist, Catherine Hamlin, came to Ethiopia with her husband Dr. Reginald Hamlin in 1959 in response to an advertisement in the Lancet Medical Journal. 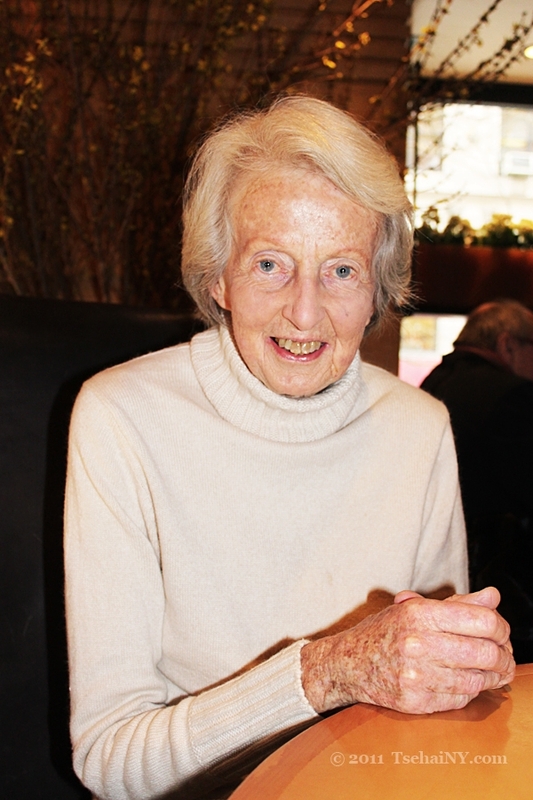 “There were very few obstetricians and gynecologists at that time,” recalled Catherine Hamlin. “It [advertisement] said ‘Ethiopia, Addis Ababa, gynecologist wanted to fund a school of midwifery and nurses’. We applied because my husband had been a teacher and obstetrics was his favorite subject.” The school later had to be closed due to lack of funds. “But by then we had seen the fistula patients come in and they broke our hearts. These women suffer enormously,” said Catherine Hamlin who at 87 still operates one day a week. In search for fistula patients Catherine Hamlin’s late husband Reginald Hamlin would often go out into the grounds of the hospital and would see them exiting the gates. “He would say, ‘why are you going out the gate? Come into the hospital.’ And they would say, ‘no we are not welcome’.” The government later gave the hospital 10 free beds which went to the fistula patients. After 10 years, the decision to build a separate hospital for the fistula patients was made and in 1974 Addis Ababa Fistula Hospital was founded by Drs. Reginald and Catherine Hamlin. It remains the only hospital of its kind in the world dedicated to women with obstetric fistula. The hospital has treated over 30,000 women with a cure rate of over 90%. Along with her deep faith Catherine Hamlin explained the tremendous need of the women and knowing the hospital can help most of them as being inspirations. On February 1, 2011, Hamlin Fistula USA launched and joins sister organizations in UK, Australia, Sweden, Netherlands, Germany, and New Zealand. In addition to Addis Ababa Fistula Hospital, there are five hospitals located in key areas throughout the country: Bahir Dar, Mekele, Yirgalem, Harar and Metu. Desta Mender, a ‘self help’ village, has also been established for women who cannot be cured in the normal way. They are welcomed to reside in the village and trained to be nurse-aides. And in 2007, The Hamlin College of Midwives commenced with the first class recently graduating. Although the city of Addis Ababa has grown and roads are being constructed, poverty and lack of roads for those in the countryside remain problematic. “Many roads have been built over the years but still there remains to be those very important roads from the community to connect you to the main roads,” said Dr. Fekader Ayenachew, who oversees a center in New Gelle, south of Awassa. “The women cannot get easy medical help when they need it and poverty of course is an enormous factor. Most of the country people are very poor,” said Catherine Hamlin. One of the obvious changes in Ethiopia from the time of Catherine Hamlin’s arrival in 1959 is the growth of the population. While in 1959 about 11 million people lived in the countryside, there are about 40 million people living there now. “That’s why the problem is not going away because the number of people who don’t have access to services has increased. It’s really a problem of not getting access to services,” said Bennett. However, with her staff, the Addis Ababa Fistula Hospital, 5 centers and The Hamlin College of Midwives, Catherine Hamlin is confident that one day obstetric fistula will be eradicated in Ethiopia. For more information, visit www.hamlinfistulausa.org. Thank you Dr. Hamlin for dedicating your life to regifting dignity back to women. You have touched more lives than you know. I pray all of us find our purpose on earth and deliver. My mother was one of the beneficieris of this sacred job of Dr. Hamlin. She was a fistula victim 20 years ago. She has been completely cured after treatment in Fistula Hospital, thanks to God and Dr Hamlin. Ethiopia is a country in which large segment of citizens live under different miserable conditions. Ethiopian leaders donot care as such for citizens. They are busy talking about politics. 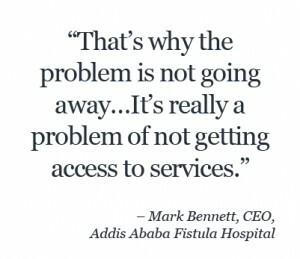 I kindly request educated and rich ethiopians to help the sacred job being carried out by Fistula hospital and others. Such an amazing woman. I am sure her great work will continue until this problem is eliminated.